﻿ Ephesians 4:24 and that ye put on the new man, which is created in conformity to God in righteousness and in the holiness of the truth. and that ye put on the new man, which is created in conformity to God in righteousness and in the holiness of the truth. and to put on the new man according to God, the man who was created in righteousness and piety of the truth. and put on the new man, that after God hath been created in righteousness and holiness of truth. And put on the new nature (the regenerate self) created in God's image, [Godlike] in true righteousness and holiness. And you should put on the new person who has been [re-] created to be like God in true righteousness and holiness. and put on the new man, which, according to the will of God, is created in righteousness and true holiness. after the image of God, in justice, sanctity, and truth. and your having put on the new man, which according to God is created in truthful righteousness and holiness. and to put on the new man, who has been created in harmony with God in the righteousness and holiness of the truth. and put on the new self which has been created in likeness to God, with all the uprightness and holiness that belong to the truth. And to put on the new man, which is created after God, in righteousness and true holiness. And to put on the new man, created according to God in justice and sanctity of truth. 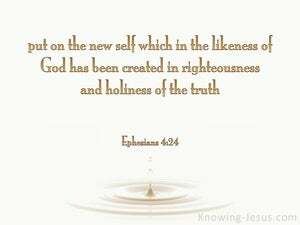 and put on the new man (in accordance with God), who is created in righteousness and holiness from the truth. And you should put on the new man, who according to God was created in righteousness and true holiness. 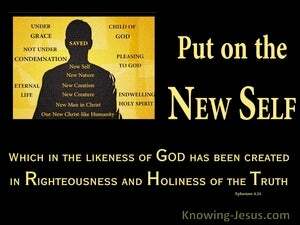 and put on that new man, which after the image of God is shapen in righteousness, and true holiness. putting on the new nature, that divine pattern which has been created in the upright and pious character of the Truth. 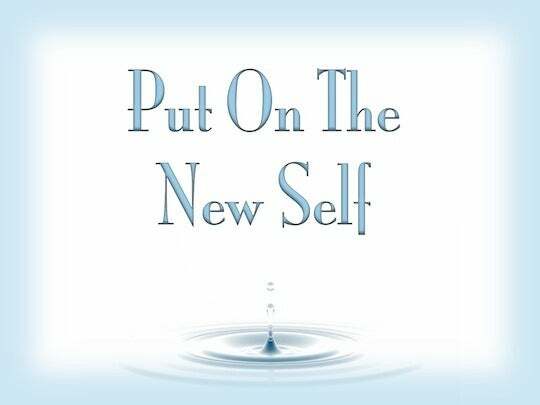 and to put on the new self, created after God's likeness, in the uprightness and holiness of the truth. 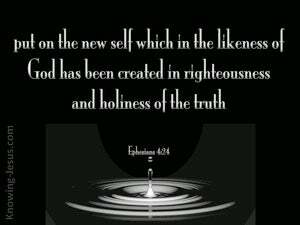 and to put on the new man who has been created in God's image -- in righteousness and holiness that comes from truth. and that ye put on the new man, who was created according to God in righteousness and holiness of the truth. 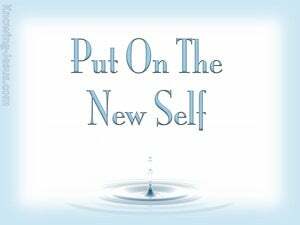 and put on the new man, created after God in righteousness and true holiness. And were to put on the man of new mould, who, after God, hath been created in his truthful righteousness and loving kindness. and put on the new man, which is created godlike, in righteousness and true holiness. And that you must clothe yourselves in that new nature which was created to resemble God, with the righteousness and holiness springing from the Truth. with that new and better self which has been created to resemble God in the righteousness and holiness which come from the truth. and put on the new self which has been created in the likeness of God, which fruits in right and holy living inspired by the truth. and put on the new man, who after God was created in righteousness and holiness of the truth. and to put on the new man, which according to the image of God is created in righteousness, and true holiness. 23 and be renewed in the spirit of your understanding 24 and that ye put on the new man, which is created in conformity to God in righteousness and in the holiness of the truth. 25 Therefore, leaving the lie, speak every man truth with his neighbour, for we are members one of another. For we are buried with him by baptism into death, that just as the Christ was raised up from the dead to the glory of the Father, likewise we also walk in newness of life. For we are his workmanship, created in Christ Jesus for good works, which God has prepared that we should walk in them. For unto those whom he knew beforehand, he also marked out beforehand the way that they might be conformed to the image of his Son, that he might be the firstborn among many brethren. For in Christ Jesus neither circumcision avails any thing nor uncircumcision, but a new creature. Put on the whole armour of God that ye may be able to stand firm against the wiles of the devil. Beloved, now we are the sons of God, and it is not yet made manifest what we shall be; but we know that if he shall appear, we shall be like him; for we shall see him as he is. Thy throne, O God, is eternal and for ever, the rod of righteousness is the sceptre of thy kingdom. Awake, awake; put on thy strength, O Zion; put on thy beautiful garments, O Jerusalem, the holy city: for from now on the uncircumcised and the unclean shall no longer come into thee. Sanctify them in thy truth; thy word is the truth. But unto the Son he said, Thy throne, O God, is for ever and ever: a rod of equity is the sceptre of thy kingdom.